4.11 Do patients get enough therapy in hospital? 4.11.1 What happens when I transfer home? 4.17 Overall benefits of private physiotherapy for Neurological Conditions. 7.5 What services are available at the moment? 8.1 What are the options for working in private practice? 8.2 What are the different types of practice? 8.3 What types of referrals will be received in private practice? 8.5 How do you let people know that you and your practice exist? For many recently graduated physiotherapists the idea of working in private clinics is an attractive work opportunity. Many newly qualified physiotherapists are unaware of the various physiotherapy services offered in the private physiotherapy sector outside of musculoskeletal practices. Private practice generally is not the sector that newly graduated physiotherapists have worked. However, physiotherapy is a rapidly changing profession and with recent moves to outsourcing in England, graduates may find themselves commencing their careers outside the traditional National Health Service (NHS) . Currently, newly graduated physiotherapists are in demand both within private practice and the NHS . With senior mentors sharing their knowledge, easy access to immediate advice, and a structured continuing professional development training programme, newly qualified physiotherapists can be successful practicing within the private sector. The Chartered Society of Physiotherapy (CSP) education and continuing professional development adviser Nina Paterson states that career choices within physiotherapy have expanded and “It’s not just about musculo-skeletal services.”  This learning resource is aimed to be a tool to assist in increasing newly graduated physiotherapists awareness of services available privately such as neurological, respiratory, occupational, and oncological physiotherapy. Each section will give an in depth discussion surrounding the importance and need for these areas of physiotherapy, the efficacy and benefits in providing care in private practice settings, followed by an outline of steps to start up your own private physiotherapy clinic. We will encourage the learner's deeper understanding of several areas within private practice through reflection questions, quizzes, videos, and opportunities for further reading. To introduce our topic to the reader and create a firm foundation for learning, we will begin by discussing the physiotherapy profession, the role played by a physiotherapist, waiting times within the NHS, and the development of the physiotherapy scope of practice. What is physiotherapy? Role of a Physiotherapist. The statement above demonstrates the use of a holistic approach to asses and treat service users. Many presenting symptoms can originate or be influenced by social or emotional factors, therefore in order to provide truly patient centred care and improve quality of life, all elements of the service users life such as the emotional, social and physiological aspects, must be incorporated into assessment and treatment. CSP physiotherapy framework available here. For neurological services, the average waiting time was reported to be 2-4 weeks with 83% of service users seen within 8 weeks . For occupational health services, the average wait list times have improved from 3 weeks in 2010 to approximately 1 week in 2011, with the majority of referrals seen within 8 weeks . As waitlist times vary in length for each speciality, patients can opt to use the private physiotherapy services available, thus not having to wait for a long period of time for treatment. The movement from treating acute to chronic conditions due to the ageing population, the cost constraints this shift has on public services, along with the impact of technology are effecting the delivery of healthcare internationally , and in turn impacting on the physiotherapy profession. The Canadian Physiotherapy Association state that a change in the scope of practice and development of the physiotherapy profession is associated with this shift of treatment in healthcare; for example practices such as ordering X-rays and screening for orthopaedic surgery which were considered advance practices are now becoming under the scope of practice . The recognition of advanced practitioners in specific areas such as pain and oncology is another development emerging as a result of changes in population and the demands on the healthcare system, therefore broadening the scope of physiotherapy . This plays an important role in the development of private physiotherapy practices, as well as changing physiotherapy roles and broadening the scope of practice. Many people are unaware of the diverse nature of physiotherapy practice as it extends to neurological, oncological, respiratory, and occupational rehabilitation and is not limited to strictly musculoskeletal conditions. Hence, there is a need for increased awareness of these other specialities available to the public and to those who wish to work in these areas. Follow this mind map to direct your learning. You may wish to expand your knowledge by covering each section or skip forward to the section which interests you the most. You have navigated yourself to this portion of the Wiki by recognising an interest you have in neurological physiotherapy within a private setting. This section is designed to give an introduction into neurological physiotherapy, highlight the prevalence of neurological conditions within the UK, briefly discuss neurological physiotherapy services offered by the NHS with emphasis placed on two common conditions, stroke and Parkinson's disease, and conclude by outlining the benefits of private neurological physiotherapy. This will hopefully trigger questions for thought and reflection on whether neurological physiotherapy in the NHS or private practice is suitable for the career pathway you have in mind. Firstly, we will aim to answer the basic question of "What is neurological physiotherapy?" Neurological Physiotherapy is a specialist area of physiotherapy focused on the treatment of individuals with neurological conditions. Neurological disorders impact the functioning of the brain, spinal cord, and nerves. Stroke, multiple sclerosis, spinal cord injury and Parkinson’s disease are common neurological conditions . It also includes conditions of the peripheral nervous system such as Guillain Barre Syndrome. Neurological conditions can have a devastating impact on the lives of the sufferers, along with family and friends. Disturbances in the travelling of messages between the brain and the body can result in the loss of movement, sensation, co-ordination, and balance. Other aspects of bodily function, such as perception, speech, memory, cognition, and behaviour may also be effected. Therefore, it is important that neurological physiotherapists work in close partnership with other members of the multidisciplinary team including speech and language therapists, occupational therapist, dieticians, nurses, and doctors. Effective communication between patient, family members, and the multidisciplinary team is critical to positive healthcare outcomes following a neurological disorder . Neurological physiotherapists are experienced and trained to treat neurological conditions with the aim to provide interventions which assist an individual to regain or maintain their maximum movement and functional independence. This is achieved by aiding in the development of new pathways through repetition and exercise. 1. Does the role of a neurological physiotherapist still interest me and why? 2. Do I want to further investigate if working in the private sector in this area would interest me? If you have answered "yes" to the above questions, continue reading below. If not return to the mind map in the introduction section and select another speciality that may be of interest. The Neurological Alliance  reported the total number of neurological cases in England to be 12.5 million or 59,000 cases per clinical commissioning group in 2013-14, with a further 1 million cases in Scotland reported in the NHS Quality Improvement Scotland Clinical Standards on Neurological Health Services . This table represents the most common neurological conditions in England. Within NHS Lothian, it is estimated that 53,480 people are living with a neurological condition. The number of people disabled by the condition is 5,348 and an estimated 1,872 people will need assistance carrying out activities of daily living. Each year, a further 8,489 people in Lothian will be diagnosed with a neurological condition . The illustration below represents the number of people affected by neurological conditions in Lothian . A study conducted by Sue Ryder revealed that 45% of the UK population feared being impacted by a neurological condition the most which is compared to 36% who feared getting cancer. The study highlighted the beliefs of the public with regards to neurological conditions, showing that 26% of the public felt that “nothing much can be done” for people with neurological conditions . It is understandable why the general public fear being affected by a neurological condition when one takes into consideration patients poor experience with neurological healthcare. The Neurological Alliance conducted a neurological patient experience survey in 2014 . 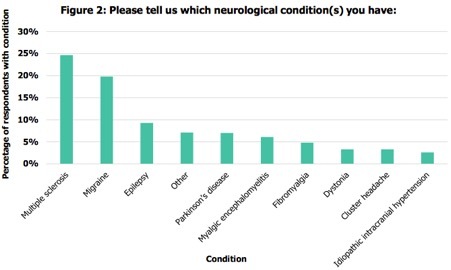 Figure 2 indicates the neurological conditions represented in the survey. The 2005 National Service Framework for Long-term Conditions  identified the need for prioritising an accurate and rapid diagnosis of neurological conditions, highlighting the importance of early diagnosis within this clinical population to reduce neurological damage, delay disease progression, elevate survival numbers, and enhance patient’s quality of life. However, it appears in 2014 that this call to action had not been achieved with 3,402 respondents to the neurological patient experience survey  voicing concerns regarding challenges experienced trying to access the treatment and services they needed. Respondents opinions emphasized the concern of long waiting times especially transitioning from general practice to specialist care settings. In December 2011, a survey of NHS Physiotherapy waiting times  in the UK was published, showing that in neurology departments, the longest wait reported was 2-4 weeks and 83% of neurological patients were seen in 8 weeks or less. The shortest wait was less than a week and the longest wait was 18-20 weeks. Only 34.1% of Clinical commissioning groups which responded to the quality of commissioning audit, utilise mechanisms to involve patients in decision-making processes and only 33% obtain important feedback on the services they provide. Taking into consideration the NHS principle of “no decision about me without me” , the NHS must actively incorporate patient views in the design and provision of services. The chart below  highlights the high number of neurological patients receiving no information from healthcare professionals on various aspects of patient care. Without crucial information, how is it possible for patients to make educated, informed decisions about their healthcare? Please click on the link to test your basic neurology knowledge. As a newly graduated physiotherapist, you should be competent in this information and scoring 100%, but you may find the quiz helpful to refresh your memory before we discuss the provision of stroke and Parkinson's disease services. A stroke is a type of cerebrovascular disease. A stroke occurs when the blood supply to part of the brain is disrupted, depriving brain cells of oxygen and nutrients. 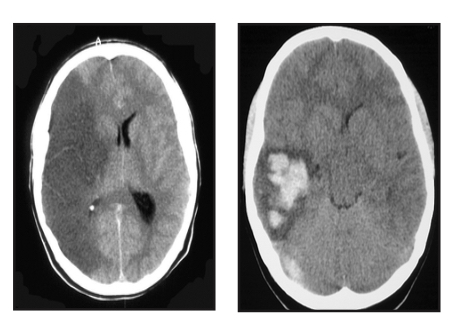 Below the left scan shows an infarct represented by the black areas and the right scan shows a haemorrhage indicated by the white areas. A stroke occurs every 3 minutes and 27 seconds in the UK, totalling approximately 152,000 strokes a year  . There is a high prevalence of stroke in Scotland due to the risk factors linked with the condition, including hypertension, smoking, inadequate exercise, high levels of alcohol consumption, and a poor diet. The Scottish Health survey 2014 revealed a shocking figure of 3.3% of males and 3.1% of females reported to have suffered from a stroke. In 2014/2015, 10,306 females and 10,310 males were discharged from hospital with stroke in Scotland. The percentage of stroke patients surviving 30 days or more after first emergency admission has improved very slightly from 81.6% in 2005/2006 to 84.9% in 2014/2015 . 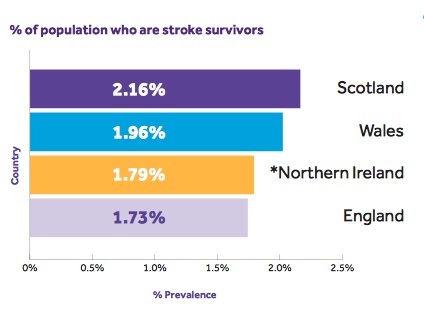 Scotland has the highest percentage of stroke survivors, meaning a large population of people requiring support and therapy post-stroke. This places additional stress on resources within NHS Scotland . Within Lothian, it is estimated that there are 1,698 first or recurrent strokes per year, along with a further 340 people experiencing a transient ischemic attack, and 6,112 people living with stroke . The NHS Physiotherapy waiting times, workforce and caseloads survey  in the UK in 2010-2011 asked the question “Do you provide a stroke service?”. Sixty-seven respondents answered the question to show overall that 42% provided an inpatient stroke service, 34% did not provide any physiotherapy for stroke, 16% provided both community and inpatient stroke services, and 8% only provided a community stroke service. The Scottish Stroke Care Audit 2015  identified clear standards for stroke services in Scottish hospitals to achieve. Standard one states that at least 90% of stroke patients should be admitted to the stroke unit on the day they arrive or the day after. 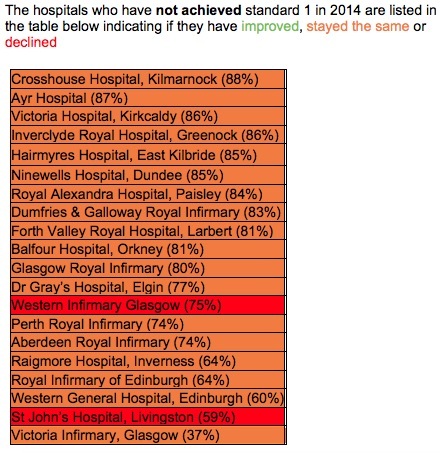 The table below shows the Scottish hospitals that did not meet standard one in 2014. There are a number of key issues within neurological physiotherapy in Lothian that have been identified within the NHS Lothian Neurological Care Improvement Plan 2014-2017 . • Improvements need to be made with regards to accessibility, including inequality of access, problems of physical access and transport for people with more complex disabilities, lack of clear, identifiable pathways and possible duplication. • There are currently only eight qualified neurological physiotherapists within Lothian. This service capacity needs to be increased. • The quality of care needs to be more consistent, improving on the current situation of irregular bouts of excellent practice and expertise. • Further encouragement needs to be provided to consider a single point of referral for neurological physiotherapy, which would supply information on demand. A study conducted by Verpillat et al 2015  examined the management of ischemic stroke in West Scotland. This study showed that out of 101 patients, 45.5% sought further physical therapy during the 1-year follow-up period. Often, within the NHS, the provision of physiotherapy is based on achieving goals within an expected timeframe. Unfortunately, if progress is limited, the continuation of physiotherapy may be questioned and focus may shift towards self management of the condition with less frequent physiotherapy sessions . Do patients get enough therapy in hospital? Rehabilitation is evidence based medicine utilised “to reach and maintain optimal functioning in physical, intellectual, psychological and/or social domains, according to the World Health Organisation . It has been recognised that many patients in stroke units feel they do not receive enough therapy during their hospital stay. 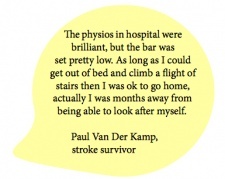 The Sentinel Stroke National Audit Programme (SSNAP)  reported that physiotherapy is required by 85% of stroke patients. Despite this, patients who need physiotherapy only receive 32 minutes on average on just over 50% of their days in hospital. This is one of the NHS's downfalls as patients should be obtaining the equivalent of 45 minutes of physiotherapy per day for 5 days a week. Below are the opinions of stroke survivors regarding the care they received in the UK by the NHS in 2013-2014, highlighting some key areas of concern . 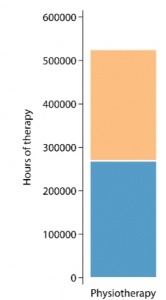 This graph  shows the number of hours of physiotherapy given throughout the year, April 2013- March 2014 in comparison to the target number of hours which would have been given if each patient who needed physiotherapy received 45 minutes, 5 days a week during their time as an inpatient. 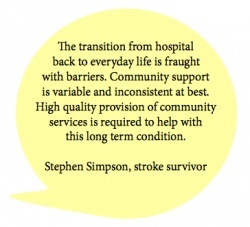 The NHS does not have sufficient resources to provide long-term physiotherapy treatment for stroke survivors. Instead, the focus is placed on the initial period following a stroke. 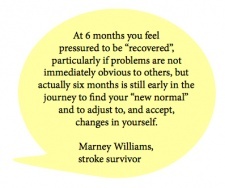 Pressure can be felt by patients within the hospital setting to reach targets fast in order to reach their recovery potential within a specified timeframe and some patients are led to believe that after 6 months, recovery stops. It is essential to know that stroke can potentially be a deteriorating condition as patients who do not continue treatment may become stiffer and less mobile. 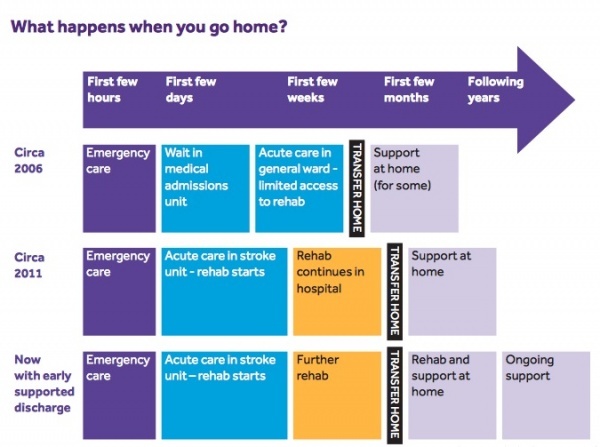 Also due to pressures on hospital beds, patients may get an early supported discharge with continuation of treatment at home , as shown in the illustration below. However, treatment at home may be delayed, reduced in intensity, and hence hinder recovery. What happens when I transfer home? 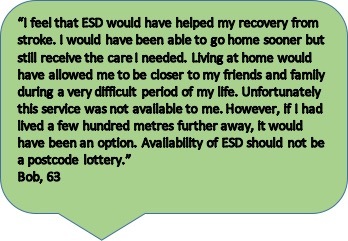 Early supported discharge can lead to better outcomes for patients, but The Second SSNAP Annual Report, 2015 highlights certain areas in the UK where this service is unavailable, leaving patients isolated with limited therapy at home. Parkinson’s disease (PD) is the second most common neurological condition in the UK, affecting an estimated 127,000 people . The NHS Lothian Neurological Care Improvement Plan 2014-2017  states that medical care alone is insufficient for this disease. In spite of this, patients with Parkinson’s disease frequently have no access to allied health professionals. The Edinburgh Parkinson’s Assessment Clinic (EPAC) is led by therapists to provide people diagnosed with Parkinson’s disease access to advice from a physiotherapist. 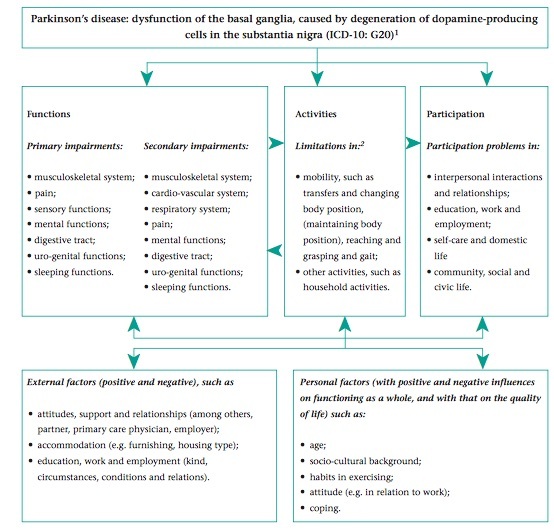 However, the EPAC offers all newly diagnosed patients of parkinsonism a once-off assessment by a physiotherapist to provide education on self management. Following the initial assessment, there is no standardised pathway of care to therapeutic services. It has been highlighted that the NHS Lothian physiotherapist service needs specific PD staff training, an intranet page dedicated to Parkinson’s physiotherapy to improve communication between professionals, a system to review staff competencies in PD regularly, a system to review patient education throughout their journey frequently, and an evaluation of PD community exercise programmes . Based on this information, the Lothian physiotherapist service for patients with PD is inadequate and requires improvements. Physiotherapy aimed at rehabilitating patients with PD focuses on posture, upper limb function, transfers, balance, physical capacity, and gait. Supporting evidence in recent years for the inclusion of physiotherapy in the care of Parkinson’s disease has increased . Management guidelines such as the National Collaborating Centre for Chronic Conditions: National clinical guidelines for diagnosis and management in primary and secondary care of Parkinson's disease  and the Royal Dutch Society of Physical Therapy's practice recommendations  have supported physiotherapy, leading to an increase in the number of referrals to physiotherapy. A systemic review and meta-analysis completed by Tomlinson et al. 2012  showed that physiotherapy resulted in significant outcomes for gait speed, balance, and the unified Parkinson’s disease rating scale. 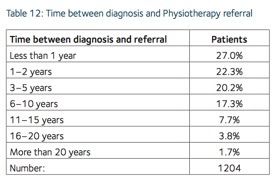 However, the 2015 UK Parkinson’s Audit  showed that only 50% of patients with PD are referred to a physiotherapist within two years of diagnosis, as shown in the table below. This Patient Reported Experience Measure (PREM) collected the views from patients with PD and their carers regarding their PD service. There were a total of 5,835 people with and carers for PD who responded to the questionnaire. 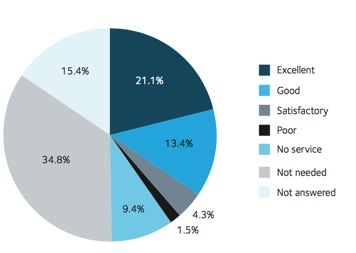 The pie chart below represents the quality of physiotherapy service offered . The All-Party Parliamentary Group (APPG) launched an inquiry to examine the availability and quality of health and social care for patients with PD and their carers. This inquiry revealed evidence emphasising the benefits of early and ongoing access to therapy services including physiotherapy, which is less likely considering the two year wait to be referred to physiotherapy following diagnosis. A preventative approach to PD care is cost effective by reducing admissions to hospital and supporting patients in the community for an extended period of time. Unfortunately, evidence showed these interventions in many areas are unavailable until a later stage in the illness, which is too late or not at the frequency needed to be beneficial. For the limited amount of patients who received access to therapy services, some patients highlighted that they were only receiving short periods of therapy before being discharged, despite the long term requirement for support associated with the nature of the condition . Physiotherapists play a key role in the care of patients with PD. Physiotherapy is the most common non-drug treatment recommended for PD   and physiotherapy is recommended by national guidelines as a mainstay of management. Some of the physiotherapists objectives are to improve the patient’s quality of life by increasing or maintaining the patients level of independence, wellbeing, and safety. These aims may be achieved by preventing falls and inactivity, reducing the patient’s activity limitation, and enhancing functional activity. Parkinson’s disease can be divided into three phases, with the patient requiring physiotherapy in each phase. The early phase is characterised by little or no patient limitations. The physiotherapists goals are to prevent inactivity, prevent the fear to move or fall, and improving exercise capacity by providing information, advice, and exercise. The mid phase is recognised by balance issues, restrictions in performance of activities, and an increase fall risk. The therapeutic intervention is focused on body posture, gait, balance, reaching and grasping, and transfers. The late phase is identifiable by the patient’s confinement to a wheelchair or bed. The physiotherapist treating a patient in this phase is focused on preservation of vital functions and prevention of pressure sores and contractures. Bloem and Munneke  recognised that PD is a condition where patients require long term support to manage, hence described the benefits of a model of integrated care incorporating a network of specialists. ParkinsonNet is a scheme established in the Netherlands to tackle problems such as inadequate interdisciplinary collaboration and communication, lack of specific training and expertise in PD, treatment focus on suppression of symptoms via drugs, and that referrals to allied health professionals such as physiotherapy being arbitrary. This model developed regional networks of inspiring, motivated, specialist health professionals to whom patients are referred for treatment long term . Parkinson’s UK and the Parkinson’s service have been advocating the ParkinsonNet model, however as highlighted by the NHS Lothian Neurological Care Improvement Plan 2014-2017 , this model has yet to be established in Scotland. In 2014, the Chair of the Lothian Parkinson’s Service Advisory Group, Dr Conor Maguire sought approval for the appointment of a Specialist Parkinson’s Physiotherapist to lead the development of a multidisciplinary model such as ParkinsonNet to help decrease geographical inequalities and standardise the provision of multidisciplinary care within Lothian. This process is ongoing currently , meaning the patients with PD in Scotland are not receiving the benefits of this model. 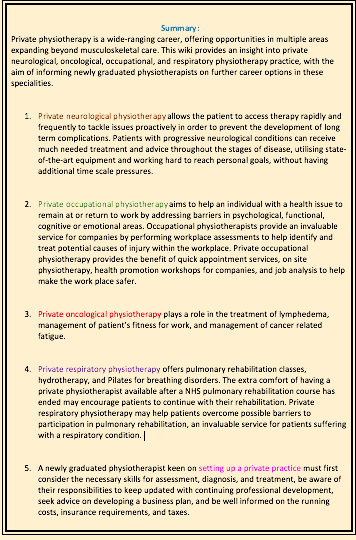 Due to the long waiting period between diagnosis and referral to physiotherapy as highlighted in table 12 above, private physiotherapy can aid in reducing shortfalls in early therapeutic and preventative interventions. 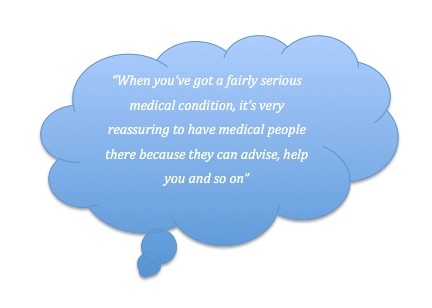 This patients experience with poor NHS accessibility highlights significant unmet needs. Private neurological physiotherapy can meet these needs providing early intervention following diagnosis, allowing patients to benefit from a preventative approach to care . Overall benefits of private physiotherapy for Neurological Conditions. Private UK neurological physiotherapy clinics such as Neurolink  in London provide specialist physiotherapy for neurological conditions such as Stroke, Parkinson’s Disease, Traumatic Brain Injury, Multiple Sclerosis, and Spinal Cord Injury. At Neurolink, the majority of clients attend x3 sessions a week, addressing issues proactively to prevent long term complications from developing. For progressive neurological conditions such as PD, the clinic aims to provide treatment and advice at each stage of the condition. A major benefit to private physiotherapy is on achievement of a client’s short term goals, focus shifts immediately to longer term maintenance and progression through a combination of neurophysiotherapy and the use of functional electrical stimulation machines, neuro pilates, personal training, and massage therapy. Many private clinics purchase state-of-the-art equipment. Neurolink uses a number of large Functional electrical stimulation machines including the RT-600 aimed at increasing the percentage weight bearing capacity of a client’s body through their legs, the RT-300 allowing for leg and/or arm cycling whilst seated, and the RT-200 providing arm and leg therapy and offering high cardiovascular demands. These machines are typically used with the aim of building up to daily 1 hour sessions. Neurolink also houses a five piece Integra wheelchair accessible gym, a five piece pilates equipment system, and a Medimotion leg bike . With longer and more frequent treatment sessions privately, patients can really experience benefits using advanced, up-to-date technology. 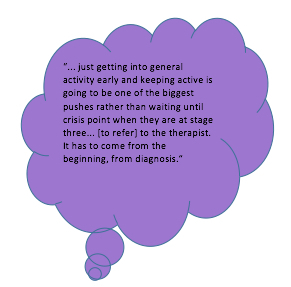 Following an interview with a physiotherapist treating neurological conditions in Edinburgh, it is clear that private physiotherapy for neurological conditions plays a pivotal role in helping clients achieve a threshold level of mobility and gain confidence and competence with exercise in order to support the transition to a local leisure club or community-based activity groups. The physiotherapist describes the role of a private physiotherapist, in addition to providing an incredible opportunity for improvement, is to help a client reflect on important outcomes from functional perspective to quality of life using careful documentation and involving family members. He believes this offers the client time to make a decision independently as to whether a change in functional status is possible and help shape their ideas about future management of their long term condition. 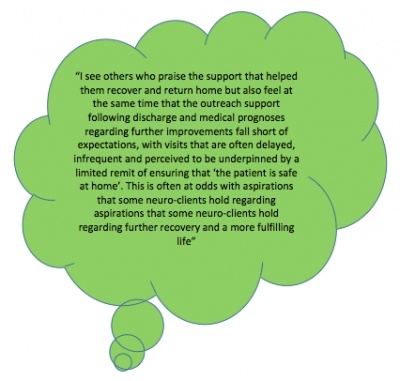 This statement highlights the need for private physiotherapy to help neurological patients reach personal aspirations and higher goals, which may take more time and effort to achieve. Receiving regular physiotherapy not only improves patients physically, but also psychologically, building patient and family members confidence, positivity, hope, and belief. A private neurological physiotherapy clinic in California known as the Challenge Center, provides long term physiotherapy for neurological conditions for people who are no longer eligible to receive physiotherapy from the health system as they have reached their insurance coverage limit. For people who had run out of hope, this private physiotherapy clinic raises money through fundraisers to provide scholarships to clients needing continuous therapy. This scholarship is in addition to patients financing therapy independently. The video  below describes the physical and psychological benefits private physiotherapy brings to the lives of people with a neurological condition and their family members. Vocational or Occupational rehabilitation refers to the services that help enable an individual with a health problem to remain at or return to work by addressing barriers in psychological, functional, cognitive or emotional areas. The emphasis in this type of rehabilitation is on restoring functional abilities in order to work or to perform other occupation related activities rather than treating a specific clinical condition. There is strong evidence that sick absences and disability management services are cost effective with reduction in sick absence by 20-60% . Musculoskeletal disorders are a huge contributor to work related illness and absence from the workplace. Musculoskeletal disorders make up one in eight approved absences from work and the average time on leave being 10 weeks. The estimated number of individuals within the UK who are impacted each year is 2 million with an estimated total of 40 million days of work missed. This equates to roughly 12 billion dollars per year in sickness and absence costs to the UK economy. 1. Does the role of an occupational physiotherapist still interest me and why? assessments to help identify and treat the potential cause of injury. Not only does this assist with treating an existing patient, but also with identifying the cause can help reduce the likelihood of another staff member in the same role being injured. 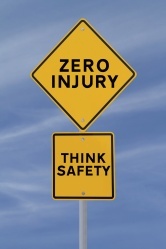 · Reducing the likelihood of further injury by addressing areas such as posture, manual handling techniques, ergonomics and workplace practices . · Helps promote recovery within rehabilitation process. · Minimizes the side effects of long-term sickness absence, which can include physical, mental and social effects. · Reduces long term incapacity. · Helps people feel like they contribute to society, maintain their independence, and have autonomy. Receiving registered membership can be achieved in three different methods. 1. Educational achievement – completing a UK based masters level course that focuses on knowledge and skills in work and health. The course must be in ergonomics, occupational health and safety, vocational or occupational rehabilitation. 3. Case study assignment – this route is intended for full members of ACPOHE who have knowledge and skills through work and personal development without taking university accredited courses or ACPOHE courses. Two in depth case studies must be submitted with one in field of expertise and one in another area to prove knowledge across speciality. For further information on obtaining registered membership please see the ACPOHE website . Work hardening protocols can also include behavioural approaches, pain management, and condition education along with return to work advice. A study was performed on employees of the Northern Ireland Civil service who had access to self-referral occupational physiotherapy to determine if physiotherapy could improve work function scores, VAS scores, and adjusted clinical scores. 231 patients received treatment ranging from 1 to 6 treatment sessions. The most commonly reported regions were back (56%), neck (14%) and shoulder (10%). Following intervention work function scores improved on average by 63%. 94% of patients reported improvements on VAS scores, with significant variance with number of treatment sessions attended (x=1.3, 2df, p< 0.001) and adjusted clinical scores showed improvement in 84% of patients with significant variation depending on number of treatment sessions attended (x=8.5, 2df, P <0.05) . A study was performed on one hundred and three patients working at a Volvo car manufacturing plant to determine if a graded activity program combined with traditional medicine was better than traditional medicine alone. Patients were included if they had been on sick leave for under six weeks with no previous diagnoses of low back pain in the previous 12 months. Patients within the graded activity program performed the program with a physical therapist and included 4 parts: work place visit, back education, submaximal graded exercises, and measurement of functional capacity. Fifty-five percent of the graded activity program patients returned to work in five or fewer appointments with the physiotherapist. Seventy-five percent had fewer than 14 appointments with the physiotherapist before returning to work. Forty-percent of control group patients returned to work within six weeks and fifty eight percent within 12 weeks compared to fifty nine percent of patients in the activity group returning under 6 weeks and eighty percent within twelve weeks . In January 2015, Fit for Work Scotland advice line became active with further services including GP referrals following shortly after. The services are available in NHS Lanarkshire, NHS Lothian and NHS Tayside areas. Fit for Work Scotland was started by the UK government to help employees, employers, and GPs managing the significant number of days' absence from work. Fit for Work Scotland includes advice and assessment to better manage this. 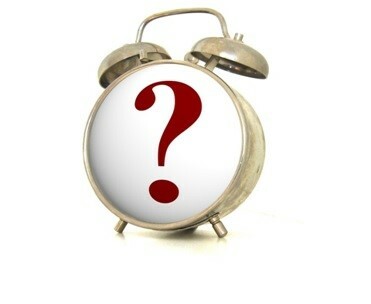 In order for employees to be considered for Fit for Work Scotland, they must have reached four weeks' absence from work or are anticipated to be. At this point, a GP or employer is able to refer an employee to Fit for Work with the employee’s consent. Where Fit for Work Scotland is not available in an area, patients can be referred to Connect which provides services to NHS organizations across Scotland. Connect is an established private physiotherapy company with community service contracts with NHS. All services through Connect are free NHS services and are provided in community locations. Connect provides workplace assessments, ergonomic assessments, on and offsite physiotherapy, functional capacity evaluations, and return to work programs . For NHS occupational health services, a survey of 48 departments found that majority are seen within 1 week with 23 departments have waiting times over 2 weeks and 100% of departments reporting patients being seen within 8 week maximum . Within the UK, private physiotherapy companies are providing services to employers to help make the work place safer and help those who are requiring physiotherapy services return to work faster. Many of these companies including Physiomed  Physis and Bush & Company  are doing this by preventing employees from missing time at work through job analysis, ergonomic assessments, health screening and functional evaluation of employees. One of the benefits for employees who have access to private occupational health services is the quick appointment service with some patients even being seen within less than two days of booking. Along with quick appointment times, physiotherapists working privately can provide more flexible scheduling to meet individual needs. Companies such as Scottish power, Abelio, ASDA, Uniliver, Edinburgh City council and Edinburgh airport all rely on private occupational physiotherapy to treat their employees. On site physiotherapy – large-scale companies can benefit from onsite physiotherapy since it allows for direct communication with management staff. Management can be kept up to date with the progress of employees with their consent to assist with scheduling and planning. Along with the direct contact with management, Human resource departments can be kept up to date on current data to better understand causes of absence. With onsite physiotherapy, a therapist can provide services on specified days per week depending on the number of employees required to see and at the request of the employer. Health promotion – physiotherapists are able to provide workshops for business or companies that are tailored to the department and the demands placed on the employees themselves. 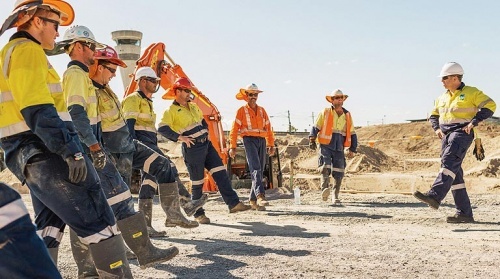 These topics include specific manual handling skills to reduce the risk of injuries, promoting good physical health and being fit for the work demands, which refers to the bodies ability to cope with the specific task. Data analysis – private occupational health companies provide data analysis services that allow for better allocation of money and resources for the prevention of further sick absence. The data can be categorized to reflect specific areas including musculoskeletal, medical or psychosocial causes. Having data on sick absence allows for resources to put towards prevention in areas with the most need allowing a shift from a rehab to prehab approach to employee health. Answer these quiz questions to confirm your learning and understanding of the information provided above. 1. What benefits do occupational physiotherapists provide to employers? 2. What are the three different methods to achieve registered membership with ACPOHE? 3. Name the three key elements addressed by a work hardening exercise protocol? 4. What are the criteria an employee must meet to be referred to Fit for Work Scotland? 5. Discuss the benefits of choosing private occupational physiotherapy? So you're interested in working privately as an oncology physiotherapist. This section was developed to give a brief view of the role the physiotherapist has in both the NHS and the private setting. Firstly will give an overlook into the prevalence of cancer in Scotland, followed by the waiting times in the NHS, service evaluation in the NHS and how the services compare in the private sector. Hopefully this will trigger some thought into the current and emerging career pathways physiotherapy has to offer. Lets first look at the role of the physiotherapist in oncology. Physiotherapists working in oncology help people that have been diagnosed with cancer, are undergoing treatment, have survived cancer, and also can be involved in palliative care. The CSP has argued for the need for specialist oncology physiotherapists. Physiotherapists can also advise on physical activity after cancer diagnosis. Research has suggested that exercise can decrease the risk of the cancer arising . The physiotherapist has a role in lymphedema, mobilisation, managing cancer related fatigue,  and even managing fitness for work . These roles are similar whether physiotherapists are working in the NHS or in a private setting. Services that physiotherapists will be involved in can include outpatient's cancer rehab and a musculoskeletal cancer service. Patients can also self refer and so would avoid GP visits whether it is private or within the NHS. To read more into the opinion of the CSP for the need for more specialist oncological physiotherapists please click here . 1. Does the role of an oncological physiotherapist still interest me? Next let us look at the prevalence of cancer in Scotland to understand this population group. The Scottish government and MacMillan cancer support compiled a report from a cancer patients experience survey . The main findings showed that the majority of people (94%) said that they had a good experience overall, 84% were linked with a cancer nurse specialist and 87% felt that they were treated with dignity and respect at all times. However, the report did highlight areas of which patient experience could be improved. This included diagnosis where 28% were not informed of the option to bring a family member or friend into the room when hearing their diagnosis, 25% were not made fully aware of what was wrong with them, and one third of patients were not given written information about the type of cancer they had. The picture below illustrates the waiting times for seeing their GP after they thought that something may be wrong. 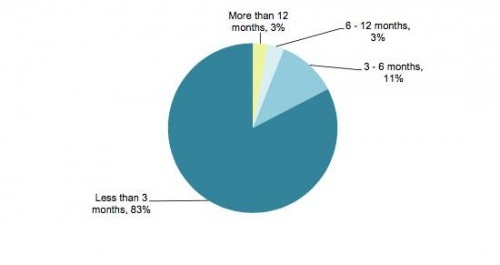 Most people see there GP in a timely manner with 83% waiting less than 3 months. The HEAT standard was developed to ensure quick and timely diagnosis and treatment for those suspected of cancer. It aims to have 95% of patients diagnosed with cancer to begin treatment within 31 days of decision to treat and 95% of those referred urgently with a suspicion of cancer to begin treatment within 62 days of receipt of referral . We can see that in NHS Scotland performs well in December 2014 at 94.2% were refered within 62 days of receipt of referral. To read further into the HEAT standard clickhere. To get an understanding of the differences between oncology services in the NHS and the private sector we will provide some information on the services the NHS provides first before looking at private. Physiotherapists may also work in private hospitals or clinics. The role of a Physiotherapist in a private hospital is similar to those that may work on a ward in the NHS. The Spire Roding hospital  is an example of a private hospital that offers private oncology physiotherapy treatments. Physiotherapists can also refer patients into private hospitals for an appointment with a consultant. An example of this can be seen within the Princess Grace Hospital. 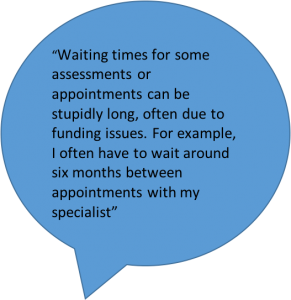 Waiting times may be shorter to see the consultant than in the NHS and so may attract patients to use their services rather than the NHS. The hospital offers a fixed price treatment. This means that there are no hidden cost after treatment if the patient needs to stay longer for example. Also, people who have health insurance may be covered and so could utilise the facilities of a private hospital instead of going through the NHS. There are hospitals run by insurance companies sure as the Bearwood hospital run by BMI which has access to physiotherapy services directly. Physiotherapists who work here can also refer quickly within the hospital if necessary. Companies such as Aviva include physiotherapy as part of the cover for cancer care. They have no limit on the amount of rehabilitation needed which may give people longer treatment than they may have received in the NHS. This may enable patients to receive further input, if needed, to return to work and daily activities so that patients can return to baseline. It is important to note that when working in private clincs or practices Physiotherapists will still have to conform to CSP and HCPC guidelines. There may be varying working hours in these types of settings that may suit a newly graduated physiotherapist. When applying for jobs, see what type of further education oppertunites the company offers for improving you knowledge and CPD. If oncological physiotherapy is the area that you feel most suited to then we receommend you read these additional resources to gain further knowledge. 1. Patients with cancer can sometimes feel as though they are treated as a set of cancer symtoms rather than an individual. What can you do as a physiotherapist in oncology to make a cancer patient feel respected and cared for with a holistic approach? 2. Open communication is key to positive patient experiences in healthcare. What aspects of communication do you feel are important when dealing with a young newly diagnosed cancer patient? 3. Anxiety and depression are commonly seen in cancer patients, impacting patient's effort and motivational levels in physiotherapy. How would you, as a physiotherapist alter your treatment to cope with the emotional turmoil associated with cancer? This section has been developed to explore the emerging role physiotherapists can play in the private setting for patients suffering from a range of different respiratory illnessess, and will concentrate on chronic obstructive pulmonary disorder (COPD). So what exactly does a respiratory physiotherapist do? Respiratory physiotherapists treat a wide range of conditions. These range from COPD and cystic fibrosis, to post surgical patients in intensive care and high dependency units in hospitals. The services of a respiratory physiotherapist can be utilized at any stage of the disease progression, ranging from early diagnosis through to care at the terminal stage. 1. Does the role of a respiratory physiotherapist still interest me? Each year, lung diseases are responsible for a large number of hospital admissions. In 2011, 694,000 patients were admitted, with 6,120,400 bed-days due to lung disease . Figure 1 demonstrates the different number of people diagnosed with lung disease compared to cardiovascular disease and cancer. Research has suggested that the prevalence of lung disease in the UK is growing. 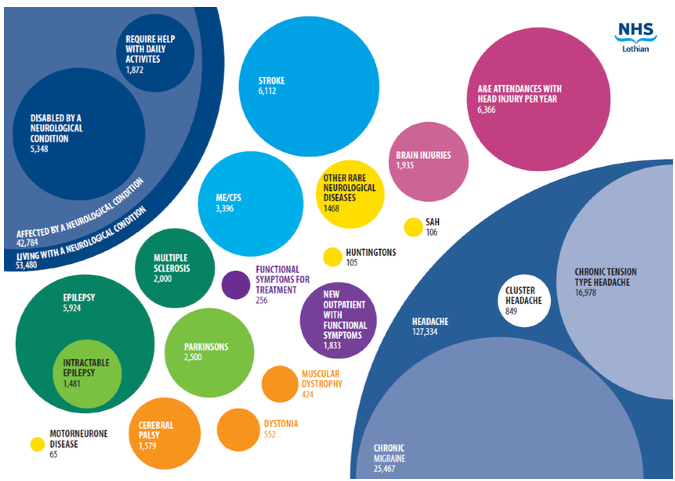 For example, the diagnosis of COPD has increased by approximately 27% in the last 10 years, from under 1600 to 2000 people per 100,000 These figuresdemonstrate that lung disease is a potentially massive burden on the NHS, with interventions needed to address the treatment plans for these patients. Pulmonary rehabilitation classes generally last from between 6-8 weeks, with 1-2 sessions a week. People with a variety of respiratory conditions can attend, with the most common condition being COPD. It consists of a group exercise program, followed by an educational talk to increase their knowledge regarding their respiratory disease. The sessions are supervised by a health professional. To be allowed to attend a pulmonary rehabilitation class with the NHS, their GP or district nurse must first refer patients, if they are deemed suitable. Hospitalisation due to exacerbations of COPD cause the NHS a huge economic burden, with an annual cost of £810 to £930 million. It results in 1.4 million GP visits a year, as well as 1 million bed days a year . Pulmonary rehabilitation has been proven to help prevent flare ups of COPD, thus helping reduce the burden of these illnesses on the NHS. 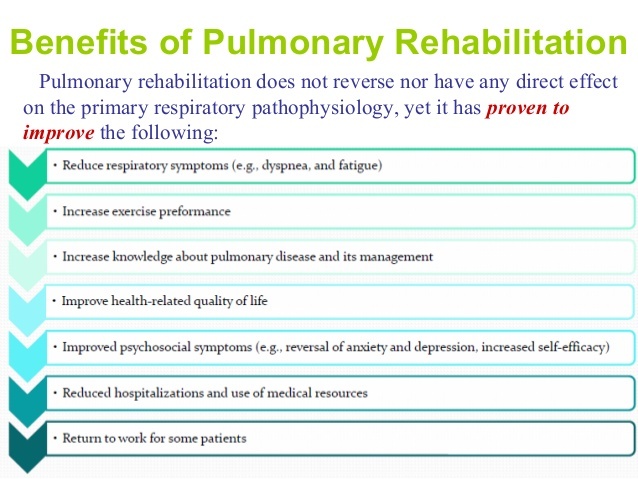 However, although there are obvious benefits associated with pulmonary rehabilitation, it is not without its downside. Due to the need to be referred to these classes, it increases the waiting time for the attendance of classes. Issues with patient compliance have also been documented. Attendance is as low as 50% , with 23-31% of patients failing to complete the course. Due to patients not showing up for classes, this prevents other patients from accessing this service, hindering them in their rehabilitation and increasing waiting list times for the classes. A recent study highlighted a few problems associated with pulmonary rehabilitation classes provided by the NHS. Patient interviews drew attention to a number of different issues with these rehabilitation classes. Some found transport and parking to be an issue, whilst others found the timing of the classes and the day of the week to not suit them . Accessing physiotherapy privately would offer them the opportunity to discuss other options with the physiotherapist, allowing patients more autonomy with the timing and location of their classes. As people may be working full time, this gives them the choice to obtain physiotherapy outside of their working hours, helping progress their rehabilitation. Another possible barrier for attendance of these classes was the environment in which they were held, which can potentially be intimidating to patients. A study carried out by Hogg et al. discovered that being surrounded by fit and healthy people was disconcerting to people suffering from respiratory disease. 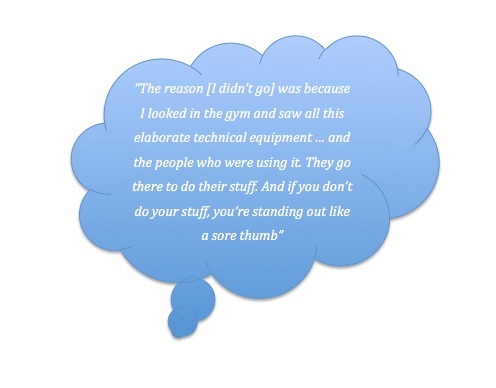 One patient interviewed felt intimidated by the other so-called 'healthy' users of the gym. If people were offered their own rehabilitation classes in a more private discreet setting, offering them the opportunity to feel comfortable in their surroundings, patient compliance with the programme could potentially increase. As pulmonary rehabilitation classes generally only last between 6-8 weeks, patients aren’t able to avail of these services after the program has finished, instead relying on themselves to continue their exercises. It can be argued that if patients have enough motivation to proceed with these classes, thus increasing their quality of life and ability to carry out functional activities, they will be willing to pay the extra cost of the rehabilitation. Another point of interest highlighted in the study by Hogg et al. showed that some participants were worried about carrying out their rehabilitation without the comforting presence of medical staff. 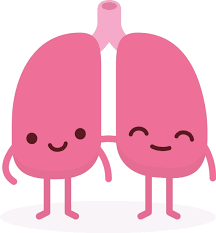 Without a doubt pulmonary rehabilitation classes provided by the NHS are an invaluable resource, but this extra comfort provided by physiotherapists after their course has concluded would encourage patients to continue in their rehabilitation and to not halt their progess. What services are available at the moment? The cost of private respiratory physiotherapy consultations and treatments range from £50 - £80 per treatment. There are a range of different respiratory physiotherapy services available in the private sector. For example, BUPA offer coverage for respiratory conditions ranging from pulmonary rehabilitation classes, hydrotherapy and pilates for breathing disorders. By registering with the CSP website on the Physio2u page  respiratory physiotherapists can advertise their services to the public. As patients suffering from respiratory disease, they may have a wide range of different delibitating symptoms. It is important for physiotherapists to keep this in mind when treating their own patients. If you are still considering working in or setting up a private practice, below are a number of areas and points to be considered before entering this field. This section will detail different models of private practice as discussed in the CSP’s “Thinking of Private Practice: A guide for physiotherapists” , including financial, equipment and marketing matters. What are the options for working in private practice? • Treating the occasional private patient – any chartered physiotherapist can accept private business from a self-referring patient, or on referral from any other professional. • Working as a support worker in a private practice - it is possible for Associate members to work as self-employed private practitioners. To remain within the scope of practice of a CSP Associate member, it is essential that your work is delegated to you by a registered physiotherapist, which requires a formal arrangement between you and a physiotherapist. In private practice this will need to be determined by the written “contract-for-services” that you will create as the legal basis for the operation of your services. • Becoming a partner in an existing practice - if you are considering becoming a partner or entering into a directorship, legal and financial advice should always be sought and a formal partnership or directorship agreement will need to be established. • Purchasing an existing practice – it is possible to purchase an existing practice that is already up and running with its own equipment and clientele. Businesses are often advertised in CSP’s Frontline publication, Physio First’s in Touch Journal as well as in local papers. • Setting up a new practice - a practice can be owned by a sole proprietor, by a partnership of two or more people, or by Directors of a Limited Company. Each of these scenarios will have different tax and legal implications, and these should be considered before choosing which is the most appropriate for your circumstances. For this type of practice, two or more people share the risks, costs and responsibilities of being in business. Partners do not enjoy any protection if the business fails. Each partner is self-employed and takes a share of the profits. A sole trader runs their business as an individual. You are responsible for all aspects of the business and you pay personal tax on the profits of your business. You will be personally liable for any debts incurred, meaning that this could be a risky option for businesses that need a lot of investment. Advantages: independence, any profits made go to you. Disadvantages: lack of support, unlimited liability, and personal responsibility for any business debts. Limited companies exist in their own right and company finances are distinct from the personal finances of their owners. Shareholders are not responsible for the company’s debts unless they have given guarantees however, they may lose any money they have invested if the company fails. What types of referrals will be received in private practice? • GP referrals – there are a number of factors that may impact upon referrals from GP’s such as the GP being responsible for purchasing physiotherapy services for their community. It is important here to highlight that GPs do not directly commission health services in Wales, Scotland or Northern Ireland.  As a physiotherapist you may need to apply to the GP directly to become capable of providing physiotherapy services to a particular community. • Self referral – this will be the majority of the type of patients you will see in private practice as they are the most important market segment for independent practitioners. Evidence from self referral pilot studies by the Department of Health has delineated that people who self-refer to physiotherapy take fewer days off work and are 50% less likely to be off work for longer than one month when compared with people referred from other pathways. Patients pay for services directly to the practice and are advised to follow up with their insurance company. Practitioners complete insurance claim forms to be reimbursed for services by the insurance company. The majority of insurance companies will use a GP or specialist as a pathway to a physiotherapist. Some companies however, will accept claims for patients who self-refer. It is important to note that some insurance companies may limit the number of sessions reimbursed per course of treatment. Pass the details to a legal representative. Some of these companies offer inducements (CAUTION!!!) and many will limit the number of sessions and insist upon certain pathways and protocols to be used. 1. Am I still interested in private practice? 2. If "yes", what aspects of private practice are appealing to me and why? 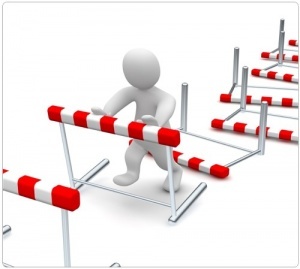 What are the potential barriers holding me back from starting a private practice? As a private physiotherapist it is imperative that you have the necessary skills for assessment, diagnosis and treatment. In private practice it is your responsibility to keep updated with continuing professional development (CPD) and deciding when and how time will be allocated to your CPD. If you are offered a position on a self-employed basis, you should ensure that you receive a written “contract for services”, which summarises the proposed relationship and arrangements. If you are hired as an employee then you should receive a “contract of employment” that outlines the main terms and conditions of employment. In either case, you should be absolutely clear about what is contained in the contract as it should summarise the relationship between you and the Practice Owner/Employer and set out the expectations for all involved. As a CSP member working in private practice as an employee, you will have a range of employment rights and obligations in a similar way to those that would apply if you were employed in any other workplace or organisation. Should you encounter difficulties in the workplace you can contact the Society’s Employment Relations and Union Services (ERUS) staff for advice. If you are working on a self-employed basis, you are not covered by the same employment rights that apply to employees. There are therefore only limited areas in which ERUS is able to assist such members; these include access to some aspects of ERUS legal services, support with responding to a complaint made against them to the HPC, and initial assistance in determining their employment status if this is unclear. However, self-employed CSP members who are also members of Physio First will be able to access further advice. The CSP’s Code of Members' Professional Values and Behaviour  outlines the professional values and behaviour that all CSP members must adhere to regardless of whether you are working in the NHS or private practice. It is your responsibility as a CSP member to comply to the regulatory requirements, the law and the requirements of your employing organization (where appropriate). In terms of cost for services, it is good business practice to give an indication of fees and the likely number and frequency of treatments before a programme commences. "Cash sales" means all income from your main business activity which is received at the conclusion of a course of treatment. Your cash sales income will be from patients paying your fees out of their own pocket and from patients covered by health insurance who will pay you and then claim the cost from the insurance company after the treatment has been completed. If a patient needs a course of treatment (more than one appointment), you may decide to charge them after each treatment rather than at the end of the course to improve your cash flow. Income from patients that are covered by health insurance but who will pass you the claim forms at the end of the treatment for you to claim from the insurance company will be "cash from debtors". There are some costs that may not initially be considered but are imperative to the successful running of a private practice. 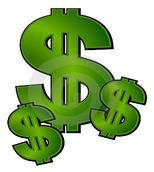 • Wages – this will be wages for staff hired by the practice or for services required from other professionals e.g. other physiotherapists, physiotherapy assistants, receptionist/secretary, accountant, solicitor. • Stationery – pens, appointment and treatment cards, headed notepaper, brochures etc. will be needed and should be professionally produced. • Uniforms and equipment - private practices may or may not provide uniforms. Within private practices it is typically the responsibility of the owner to provide the equipment and this can vary depending on contracts and the physiotherapist’s role in the private practice. In the case of a self employed physiotherapist, their uniform needs to be provided at their own expense as does any equipment they deem necessary in treatment provision. • Bills - this can include internet and telephone, property rent, electricity and heating, advertising, security systems etc. HPC registered physiotherapists are exempt from registration for payment of VAT for the provision of physiotherapy treatment even if their turnover is in excess of the statutory limit. This also means that the practitioner may not recover VAT on items of expenditure. However, if activities like consultancy and medico-legal work are carried out, these do not count towards the VAT limit, and VAT-registered practitioners may reclaim VAT on expenditure made in providing these services. This however is only usually the case in practices that specialise in these areas. In terms of being able to claim tax relief, you can claim back on the annual subscription to the CSP, the annual HPC registration fee and the Physio First subscription, as well as laundry and uniform costs, in addition to all allowable business expenses. Annual accounts are essential for Inland Revenue purposes, and again the advice of a qualified accountant is recommended, although the Inland Revenue can in many instances give helpful advice. How do you let people know that you and your practice exist? The simple answer: market yourself! The CSP’s Code of Professional Values and Responsibilities outlines what is and isn’t appropriate in terms of advertising, canvassing and publicity, therefore make sure you thoroughly read this document before you go any further with your marketing. Who you decide to connect with will depend on the specialty of your practice, but as a few suggestions, to make your practice known you can get in contact with GPs, consultants, private hospitals, nursing homes/rest homes, sports clubs etc. This guide, with the help of the CSP’s “Thinking of Private Practice: A guide for physiotherapists” has provided some brief information on the areas you will need to consider as private physiotherapist. Before taking that final step into private practice, it is strongly advised that you talk to some private-practitioners and visit their practices; contact Physio First; and seek business, financial and legal advice. This summary reiterates some of the main points from our learning resource. The role of a physiotherapist is constantly developing due to the change in healthcare services and provisions. 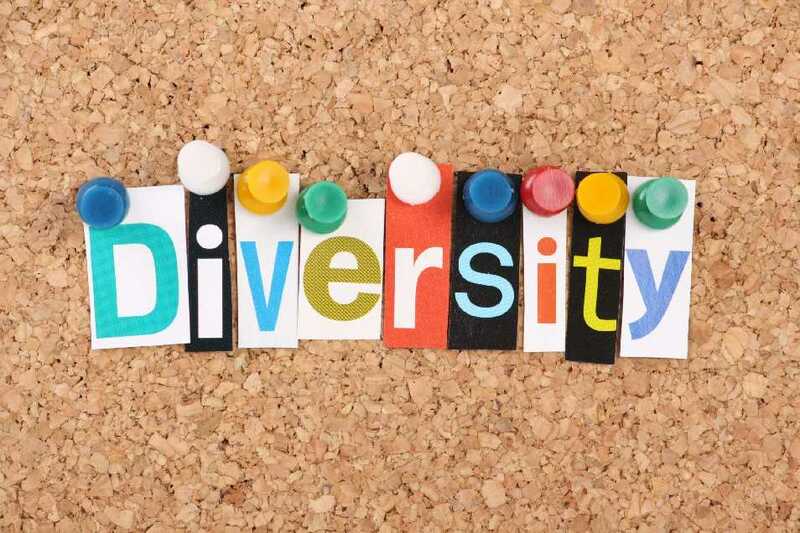 Throughout this wiki we have highlighted some the diversities found within the private sector of physiotherapy such as opportunities within neurological, oncological, respiratory and occupational rehabilitation. We have also demonstrated the many benefits of having these services available to service users. As mentioned above, there are many points to consider before becoming part of the private sector or setting up your own practice. Throughout the Wiki we have provided further resources to broaden and expand your knowledge in specialities which may interest you. Further guidelines and further steps to establish yourself within the private physiotherapy sector have been discussed. We would recommend if you are considering a career within private physiotherapy to take a look at the Physio First website . Physio First is an organisation that represents physiotherapists working in private practice. Any fully subscribing CSP member who is self-employed in private practice is eligible for membership. In addition, any fully subscribing member of the CSP who is employed by a full member of Physio First is eligible for affiliated membership. If you decide to work in private physiotherapy, it is highly recommended that you join Physio First. ↑ 2.0 2.1 Andalo D. Wanted: newly qualified physiotherapists. the Guardian. 2016. Available from: https://www.theguardian.com/healthcare-network/2015/may/13/wanted-newly-qualified-physiotherapists. (Accessed 2nd December 2016). ↑ 4.0 4.1 Higgs, J.,Refshauge, K., Ellis, E.. Portrait of the Physiotherapy Profession. Journal of Interprofessional Care. 2001; 15(1):79-89. ↑ Neurological Alliance of Scotland. Neurological conditions factsheet. Available from: http://www.scottishneurological.org.uk/content/res/Neurological_Conditions_Factsheet.pdf (Accessed 31st October 2016). ↑ 9.0 9.1 Neurological Physiotherapy Information Guide and Resource Centre. Neurological physiotherapy. Available from:http://neurologicalphysiotherapy.comfckLR(Accessed 31st October 2016). ↑ The Neurological Alliance. Neurological alliance neuro numbers. Available from: http://www.neural.org.uk/store/assets/files/381/original/Final_-_Neuro_Numbers_30_April_2014_.pdf (Accessed 23rd November 2016). 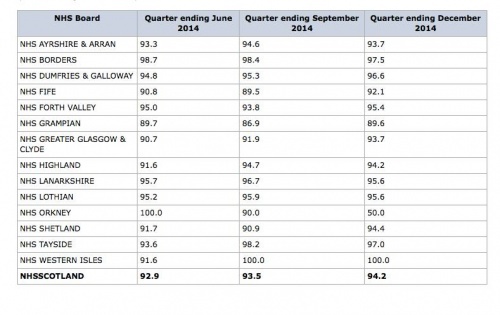 ↑ National Health Service Quality Improvement Scotland. Neurological health services: Clinical standards. Available from: http://www.scottishneurological.org.uk/content/res/final_qis_standards.pdf (Accessed 23rd November 2016). ↑ 12.0 12.1 12.2 12.3 12.4 The Neurological Alliance. The invisible patients: revealing the state of neurology services. Available from: http://www.neural.org.uk/store/assets/files/495/original/Invisible_patients_-_revealing_the_state_of_neurology_services_final_14_January_2015_.pdf (Accessed 31st October 2016). ↑ 13.0 13.1 13.2 13.3 13.4 13.5 13.6 13.7 National Health Service Lothian. Lothian neurological care improvement plan 2014 to 2017. 2015. Available from: http://www.nhslothian.scot.nhs.uk/OurOrganisation/Strategies/Documents/NHS%20Lothian%20Neurological%20Care%20Improvement%20Plan%202014-2017%20-%20Final.pdf (Accessed 31st October 2016). ↑ Sue Ryder. Public fear getting a neurological condition. Available from: http://www.sueryder.org/media-centre/news/2016/june/public%20fear%20getting%20a%20neurological%20disorder (Accessed 28th October 2016). ↑ Department of Health. The national service framework for long­term conditions. 2005. Leeds: NSF. Available from: https://www.gov.uk/government/uploads/system/uploads/attachment_data/file/198114/National_Service_Framework_for_Long_Term_Conditions.pdf (Accessed 23rd November 2016). ↑ 16.0 16.1 JJ Consulting. 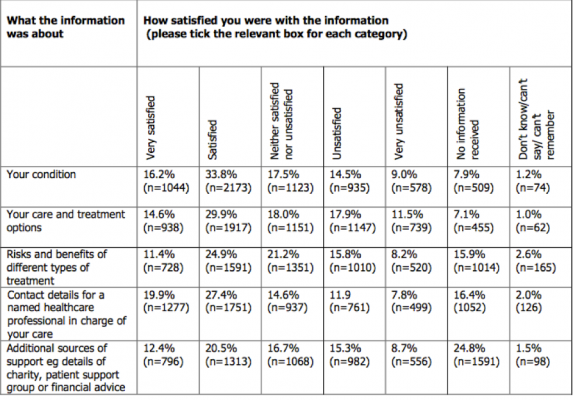 A survey of NHS Physiotherapy waiting times, workforce and caseloads in the UK 2010-2011. London: CSP; 2011 Available from: http://www.csp.org.uk/publications/survey-nhs-physiotherapy-waiting-times-workforce-caseloads-uk-2010-2011 (Accessed 11th November 2016). ↑ Department of Health. Liberating the NHS:No decision about me, without me. London:NHS; 2012. Available from: https://www.gov.uk/government/uploads/system/uploads/attachment_data/file/216980/Liberating-the-NHS-No-decision-about-me-without-me-Government-response.pdf (Accessed 1st November 2016). ↑ Scottish Intercollegiate Guidelines Network. Management of patients with stroke: Rehabilitation, prevention and management of complications, and discharge planning. Edinburgh:SIGN; 2010. Available from: http://www.sign.ac.uk/pdf/sign118.pdf ( Accessed 24th November 2016). ↑ Verpillat, P., Dorey, J., Guilhaume-Goulant, C., Dabbous, F., and Aballea, S. Ischemic stroke management in West Scotland a chart review. Journal of market access and health policy [Internet]. 2015 September, vol. 3. Available from: http://europepmc.org/articles/PMC4802692 (Accessed 1st November 2016). ↑ Ashford and St Peter's hospitals NHS foundation trust. Physiotherapy for stroke patients. Available from: http://www.ashfordstpeters.nhs.uk/physiotherapy-for-stroke-patients. (Accessed 2nd November 2016). ↑ 24.0 24.1 World Health Organization, 2001. International Classification of Functioning, Disability and Health: ICF. World Health Organization. ↑ Krakauer JW, Carmichael ST, Corbett D, Wittenberg GF. Getting neurorehabilitation right: what can be learned from animal models? Neurorehabilitation and Neural Repair. 2012; 26: 923–931. ↑ Langhorne P, Coupar F, Pollock A.Motor recovery after stroke: a systematic review. The Lancet Neurology. 2009; 8: 741–754. ↑ Keus SH, Munneke M, Nijkrane MJ, Kwakkel G, Bloom BR.Physical therapy in Parkinson's disease: evolution and future challenges. Movement Disorders. 2009; 24(1): 1-14. ↑ Keus SH, Bloem BR, Verbaan D, De Jonge PA, Hofman M, Van Hilten BJ, Munneke M. Physiotherapy in Parkinson’s disease: utilisation and patient satisfaction. Journal of Neurology. 2004 June; 251(6): 680-687. ↑ Kamsma YPT. Functional reorganisation of basic motor actions in Parkinson's disease: problem analysis, development and evaluation of a compensatory strategy training. Groningen. ↑ KNGF. Guidelines for physical therapy in patients with Parkinson’s disease. Available from: http://www.appde.eu/pdfs/Dutch%20Parkinson's%20Physiotherapy%20Guidelines.pdf (Accessed 29th October 2016). ↑ 44.0 44.1 Bloom B, Munneke M. Revolutionising management of chronic disease: the ParkinsonNet approach. BMJ. 2014; 348: 1-8. Available from: http://www.west-info.eu/files/Revolutionising-management-of-chronic-disease_-the-ParkinsonNet-approach-_-BMJ.pdf (Accessed 29th October 2016). ↑ 45.0 45.1 Neurolink Physiotherapy Ltd. Specialist neurological physiotherapy clinic: enable enhance empower-unlock your potential. Available from: http://neurolinkphysio.co.uk/index.html (Accessed 3rd November 2016). ↑ Challenge Center. About us. Available from: http://challengecenter.org/about-us (Accessed 3rd November 2016). ↑ Challenge Center. Challenge center video 2014. Available from: https://www.youtube.com/watch?v=TDGETLa4Bm8 (Accessed 3rd November 2016). ↑ 49.0 49.1 49.2 Addley, K., Burke, C., McQuillan, P.. Impact of a direct access occupational physiotherapy treatment service. 2010; 60: 651-653. ↑ Association of Chartered Physiotherapists in Occupational Health and Ergonomics, 2016. Welcome to ACPOHE. Available from: http://www.acpohe.org.uk. (Assessed 2nd December 2016). ↑ Lindstrom, I., Ohlund, C., Eek, C., Wallin, L., Peterson, L.E., Fordyce, W.E., Nachemson, A. 1992. The effect of graded activity on patients with subacute low back pain: a randomized prospective clinical study with an operant-conditioning behavioral approach. Journal of the American Physical Therapy Association. 1992; 72:279-290. ↑ 56.0 56.1 Chartered Society of Physiother. A survery of NHS physiotherapy waiting times, workforce and caseloads in the UK 2010-2011; 9-73. ↑ PhysioMed, 2016. We look after your staff, so your business looks after itself. Available from: http://www.physiomed.co.uk/what-we-do. (Accessed 2nd December 2016). ↑ Bush and Company Rehabilitation, 2016. Return to work. Available from: http://www.bushco.co.uk/vocational-rehabilitation-service/return-to-work/. (Accessed 2nd December 2016). ↑ Donnelly CM, Lowe-Strong A, Rankin JP, Campbell A, Allen JM, Gracey JH. Physiotherapy management of cancer-related fatigue: a survey of UK current practice. Supportive care in cancer. 2010 Jul 1;18(7):817-825. ↑ Chartered Society of Physiotherapy. Information paper: Fitness for work. March 2016. ↑ Chartered society of physiotherapy. Physios play key role in cancer care. August 2013; 19(14). Available from: http://www.csp.org.uk/frontline/article/physios-play-key-role-cancer-care. (Accessed 2nd December 2016). ↑ Maddams J, Utley M, Møller H. Projections of cancer prevalence in the United Kingdom, 2010–2040. British journal of cancer. 2012 Sep 25;107(7):1195-202. ↑ NHS Scotland. Scottish Cancer Patient Experience Survey 2015/16. Available from:http://www.gov.scot/Publications/2016/06/3957/downloads. [Accessed 25th November 2015]. ↑ Olsson JK, Schultz EM, Gould MK. Timeliness of care in patients with lung cancer: a systematic review. Thorax. 2009 Sep 1;64(9):749-56. ↑ ACPOPC. Association of Chartered Physiotherapists in Oncology and Palliative Care. Available from: http://acpopc.csp.org.uk. (Accessed 2nd December 2016). ↑ 72.0 72.1 72.2 British Lung Foundation. 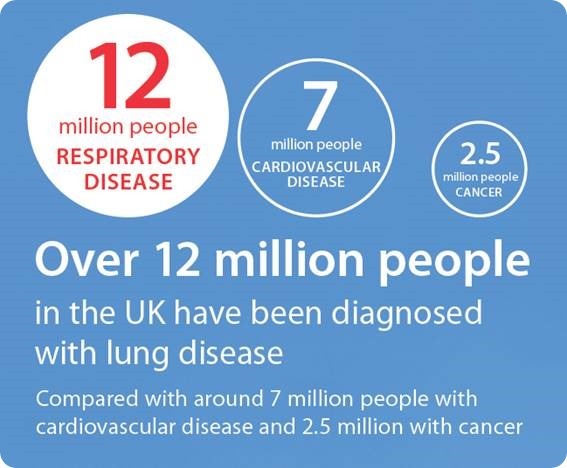 Lung disease in the UK. Available from: https://statistics.blf.org.uk/. ( Accessed 18th November 2016). ↑ Masoli M, Fabian D, Holt S, Beasley R. The global burden of asthma: executive summary of the GINA Dissemination Committee Report. Allergy. 2004; 59(5): 469-478. ↑ 74.0 74.1 Hayton C, Clark A, Olive S, Browne P, Galey P, Knights E, Staunton L, Jones A, Coombes E, Wilson A. Barriers to pulmonary rehabilitation: Characteristics that predict patient attendance and adherence. Respiratory Medicine. 2013; 107(3): 401-407. ↑ Nici L, Donner C, Wouters E, Zuwallack R, Ambrosino N, Bourbeau J, Carone M, Celli B, Engelen M, Fahy B, Garvey C, Goldstein R, Gosselink R, Lareau S, MacIntyre N, Maltais F, Morgan M, O'Donnell D, Prefault C, Reardon J, Rochester C, Schols A, Singh S, Troosters T. American Thoracic Society/European Respiratory Society Statement on Pulmonary Rehabilitation. American Journal of Respiratory and Critical Care Medicine. 2006; 173(12): 1390-1413. ↑ Keating A, Lee A, Holland A. What prevents people with chronic obstructive pulmonary disease from attending pulmonary rehabilitation? A systematic review. Chron Respir Dis. 2011; 8(2): 89-99. ↑ De Sousa Pinto J, Martin-Nogueras A, Morano M, Macedo T, Arenillas J, Troosters T. Chronic obstructive pulmonary disease patients' experience with pulmonary rehabilitation: A systematic review of qualitative research. Chronic Respiratory Disease. 2013; 10(3): 141-157. 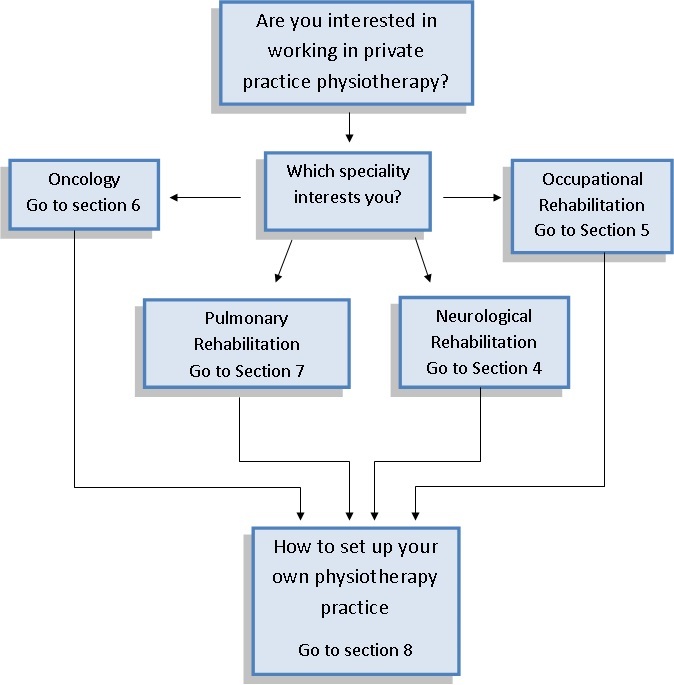 ↑ 78.0 78.1 Hogg L, Grant A, Garrod R, Fiddler H. People with COPD perceive ongoing, structured and socially supportive exercise opportunities to be important for maintaining an active lifestyle following pulmonary rehabilitation: a qualitative study. Journal of Physiotherapy. 2012;58(3):189-195. 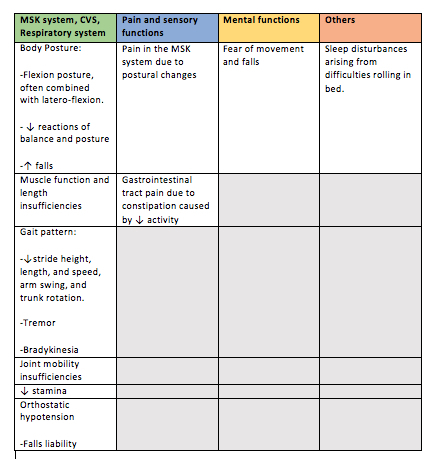 ↑ CSP, List your practice on Physio2u. Available from: http://www.csp.org.uk/your-health/find-physio/list-your-practice-physio2u. (Accessed 2nd December 2016). ↑ Global Strategy for the Diagnosis, Management, and Prevention of Chronic Obstructive Pulmonary Disease: GOLD Executive Summary Updated 2003. COPD: Journal of Chronic Obstructive Pulmonary Disease. 2004;1(1):105-141. ↑ Anon, (2016). [online] Available at: : /https://www.brit-thoracic.org.uk/document-library/clinical-information/pulmonary-rehabilitation/bts-guideline-for-pulmonary-rehabilitation/ [Accessed 18 Nov. 2016]. ↑ 83.0 83.1 CSP, Code of members' professional values and behaviour. 2011. Available from: http://www.csp.org.uk/publications/code-members-professional-values-behaviour. (Accessed 2nd December 2016). ↑ CSP, Making the business case. Available from: http://www.csp.org.uk/professional-union/practice/your-business/making-business-case. (Accessed 2nd December 2016). ↑ CSP, Scope of practice. Available from: http://www.csp.org.uk/professional-union/professionalism/scope-of-practice. (Accessed 2nd December 2016).